I’m surprised that I haven’t heard many people talk about this, much less know what this is. The biggest complaint about Samgyeopsal and its variations is its greasiness. 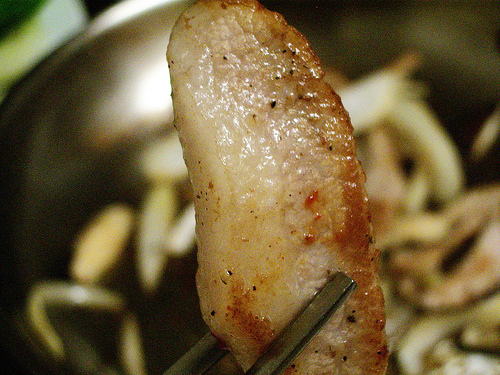 Diners dab their meat with tissue paper before, saying that there is such a thing as too much pork fat. That’s an absurd thought in my world, but I’ve been known to have the odd absurd thought myself. Next time you’re at your butcher or House of Dwaeji (that’s “pig” for you English speakin’ folk) try a bit of Hangjeongsal. It’s the perfect balance of both worlds. It has marbling similar to a beef rib-eye steak, just enough fat to soak up flavor but not so much that it gives your mouth a lube job. It has a firm bouncy texture and contains no tiny bones. So, where does this magical meat come from? I asked the usual suspects, and they didn’t know. So the usual suspects accompanied me to the butcher to find out. It comes from the front of the neck. It’s also a bit pricier than other cuts because there’s so little of it per swine. Yet the price isn’t astronomical. I think it’s because people haven’t discovered it. Or rather, it hasn’t been recognized by fancy restaurants–kind of like how monkfish was considered a trash fish ten years ago but is so revered in culinary circles these days. It’s pork jowl. Mystery solved.